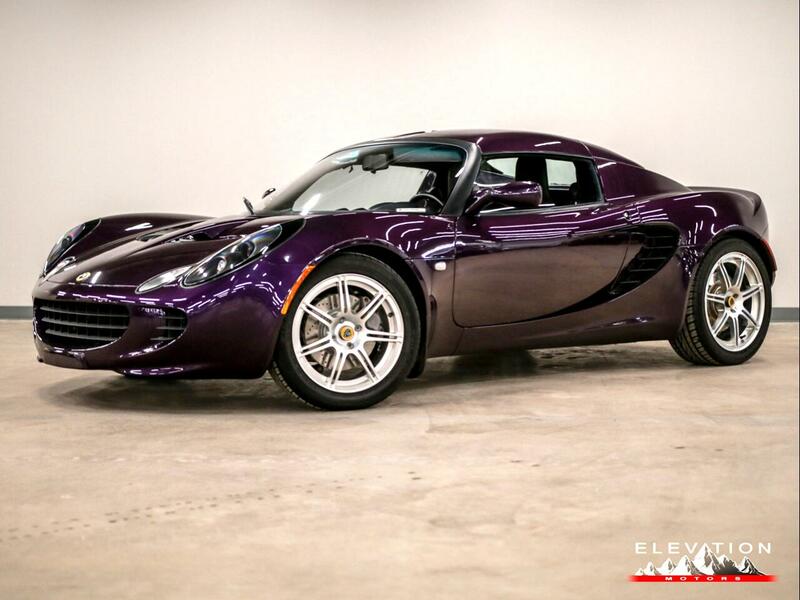 2005 Lotus Elise in unique Aubergine Metallic with Black Leather Interior in excellent condition inside and out. Rare find with both the Sport package, Touring package and the removable hard top. The soft top is immaculate and stored in its case in the rear. This Touring package includes Leather Seating, Leather Door Panels. Power Windows, Full Carpeting, and Sound Insulation. The Sport package has Optional Aluminum Forged Wheels 16" front and 17" rear that are over 20lbs lighter than the standard version in total. Also has adjustable stiffer springs and better shocks from the factory. Has a Stage 2 exhaust that sounds great. All headlight bulbs have been upgraded as well. Non Smoker. Front of the car and behind the doors has 3M clear mask protection installed. Tires are in great shape all around. All the original books included. Message: Thought you might be interested in this 2005 Lotus Elise.